Usually adware programs employ browser extensions to display commercial ads, but Save Serp Now uses another method. This adware application uses a service called ssn.exe to promote third-party content. Any security-minded user will know that it is important to remove Save Serp Now as soon as possible because the application is not reliable, and it could lead to severe computer security issues. The point is that you should not take adware lightly, because such applications as Save Serp Now could be easily exploited by cyber criminals to promote and distribute malware. On the surface, the program looks absolutely reliable. It even has an official website that you can access at saveserpnow.com. The website promotes Save Serp Now as an application that is useful for search engine optimization. The general introductory paragraph on the website says that you need to know “the history of search queries” because “there is a need to see what sites on what positions were known in advance keywords in the search engine yesterday.” That is sure quite a mouthful, but it gives an idea that Save Serp Now is a legitimate application, devised to improve your online search experience. Generally we would expect it to be possible to download such a beneficial program from its homepage, but that is not the case with Save Serp Now. Saveserpnow.com does not provide us with any download link, so from this we can infer that Save Serp Now cannot be distributed directly. Nevertheless, even if the adware application does not have a direct distribution source, it can still be spread in software packages that are available from file sharing and torrent websites. It is very common that users download and install adware on their computers without even realizing it. It means that you need to be careful whenever you are about to download something from an unfamiliar website, because, for all you know, you might be installing Save Serp Now on your computer. The application is free of charge, so it is supported by advertisements and commercial offers. After all, the adware apps need to survive somehow. Save Serp Now creators cover the development costs by promoting third-party websites and then getting paid via the pay-per-click system whenever users get redirected to the affiliated websites through Save Serp Now ads. This is not something illegal, but it does raise particular security concerns, especially as Save Serp Now could be easily misused by malevolent third parties to redirect you to corrupted websites. To prevent that from happening, you have to delete Save Serp Now from your system via Control Panel. After manual removal, be sure to check the nooks and corners of your computer for other unwanted applications. Invest in a licensed antispyware tool if necessary and protect your computer from harm. Click Uninstall a program and remove Save Serp Now. Go to Uninstall a program and remove Save Serp Now. 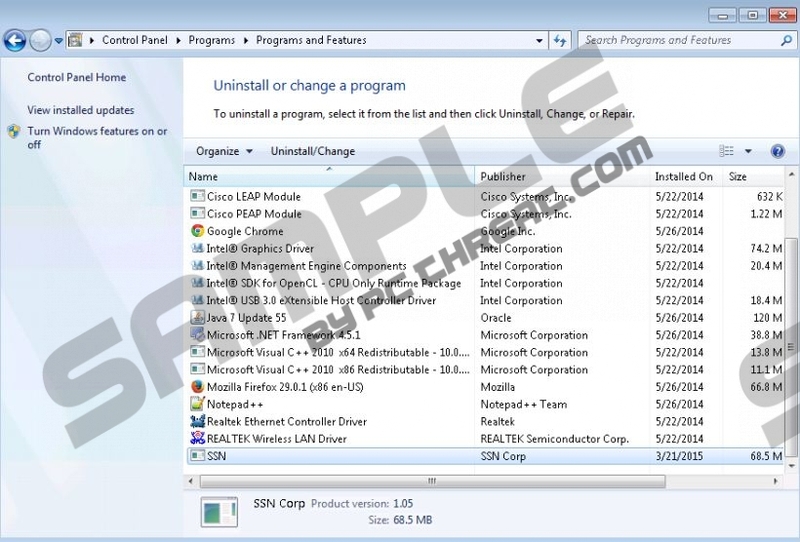 Select Add or remove programs and uninstall Save Serp Now. Quick & tested solution for Save Serp Now removal.